Please welcome our new Miss AZUL, Ponchi ;D yay! If, for some reason, Miss AZUL resigns during her tenure, the Miss AZUL 2011 position will be automatically given to 1st runner up, Annough Lykin. all Judges were having such a hard time for scoring, i am sure many ppl can imagine that. each finalist did great answer for question by judge, showed her awesome styling…. wondering- how could we scoring easily …. of course NOT ><.. Thank to all the applicants, all the entry photos are amazing job and the each paragraph were touched. It was very memorable moment for me! My dear friend- Miss AZUL 2010: Tania Tebaldi, You are my muse forever Tania! Thank you for working with me for a past year. The Best of SL Magazine, Miss Virtual World Organization, Styles of edo, Virtual Impressions, Stiletto Moody, Secondlife TV and Vanity Hair. Thank you so much for being sponsor, thank you dear judges for your time for selecting our new Miss AZUL! I'm sure you can guess how it was hard work for all the judges! For some judge, it took 3 hours to select.. Thank you so much for your time dear judges! These 10 beautiful finalists were selected by 8 judges. Each judge picked up ten applicants, and we now have the names of the ten finalists who got the highest total score. *Miss AZUL will be crowned and 5 AZUL Princess title winners will also be announced on the stage. And we’d like to thank to all the applicants, all the entry photos are amazing job and the each paragraph really touched. Honestly, to be IN top 10 or not was such a small difference. It was decision of the distress, you will see that by entry photos at AZUL Main store. Sending big Thanks and huuugz to all of you. Miss AZUL is a title given to the lady who has impeccable style, inner and outer beauty and a sense of fashion that can represent the AZUL brand. Do you think you have what it takes to represent AZUL? Mami Jewell, owner and designer of AZUL will be looking for the next beautiful lady to take the crown for a one year tenure, taking it over from Tania Tebaldi who had been reigning as Miss AZUL 2010. 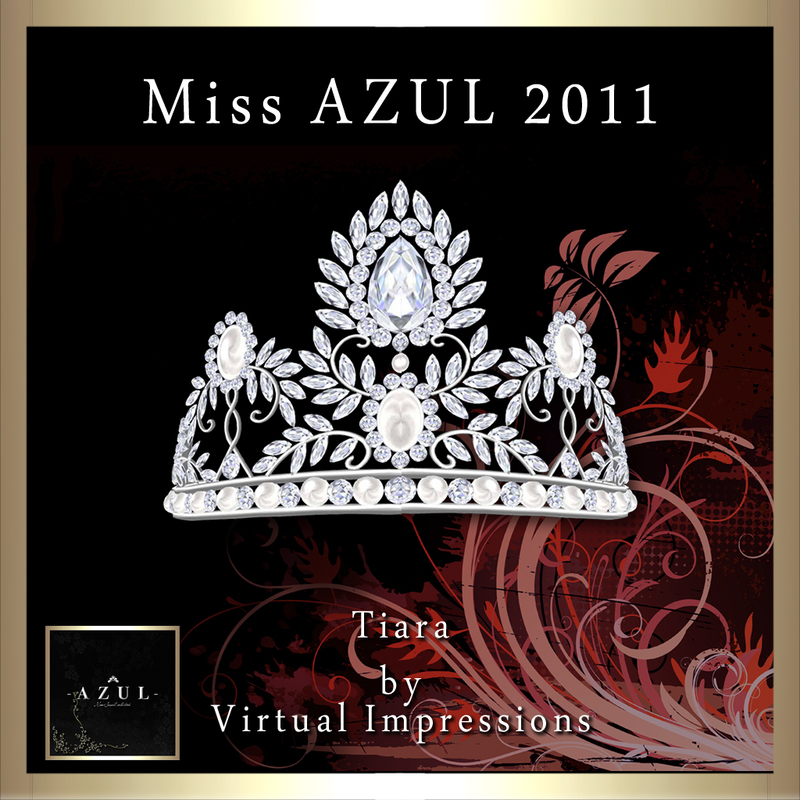 The new Miss AZUL will also be given a placement as an official finalist in the Miss Virtual World 2012 Pageant but those who are already finalists will also be accepted for entry. The Finals will be streamed live by Second Life TV to the Japanese SL residents who have become more active in the SL fashion scene. Following last year, Mami will also be selecting 5 AZUL Princess winners for all non-model entries in order to show her appreciation to the large number of non-model customers who had been supporting her. – 50,000 Linden cash prize. – AZUL wardrobe consisting of all current designs and all new releases throughout the entire one year tenure. – Appearrance in AZUL print advertisements and posters with Hair from Vanity Hair, jewelry from Virtual Impressions and shoes from Stiletto Moody. This may not, however, be done for all new releases. 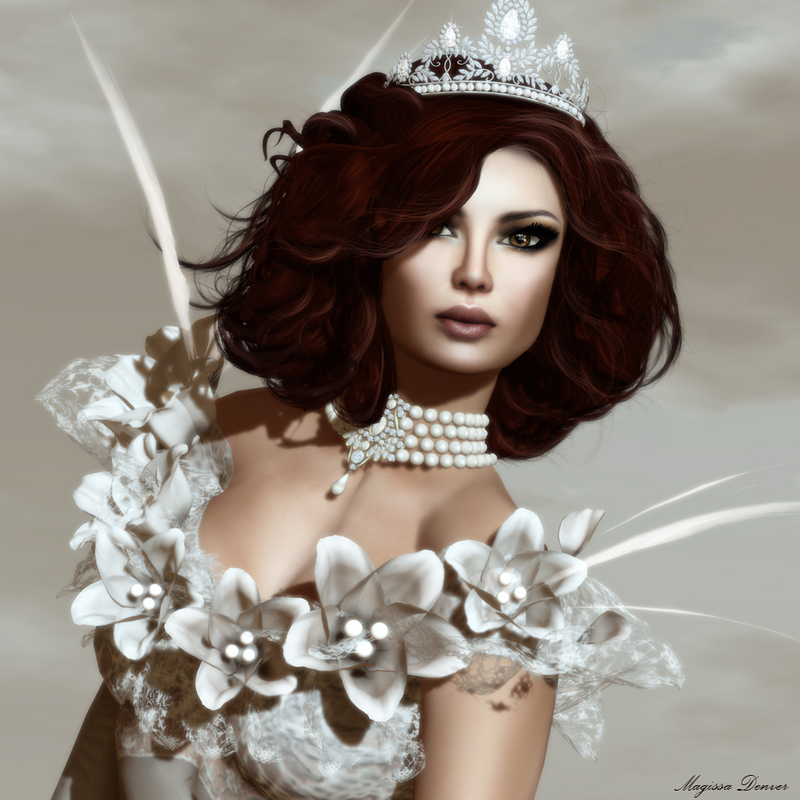 – Custom crown created for Miss AZUL by Virtual Impressions. – Official candidacy in Miss Virtual World 2012 Pageant. – One colour of choice of all new releases for the entire one year tenure. Judges will be the following (in alphabetical order of their names). 1. First selection will be based on pics. 2. After the 10 finalists are selected, we will also check your other activities such as blog, flickr page, overall reputation and points from 1 to 10 will be given to each finalists. These points will not be published. 3. Judges listed above will see you live on the Miss AZUL Finals day and will assign points from 1 to 10. These points will be added to the points gained in #2 (above) and the one with the highest score will be crowned as Miss AZUL 2011. AZUL Princess 2011 is a title that will be awarded to 5 non-model ladies that will be selected from all entries. 1. In order to qualify for this title, the entrant must not be a model, whether it is for runway, print or for store modeling. 2. Selection will be based on what the entrant wrote in the entry sheet as her paragraph of “why she thinks she best represents AZUL” and also whether she fits the AZUL brand image. The “AZUL Princess” title will be held for one year, during which the winners will receive one colour of choice from all new released dresses from AZUL.